When the eighth word of the first Star Wars movie is “taxation,” you know there’s going to be a problem. Welcome to our Star Wars movie rewatch! George Lucas’s 1999 film Star Wars Episode I: The Phantom Menace has long been a lightning rod for hatred, and for plenty of good reasons. However, revisiting the film, it’s kind of amazing to see just how badly it doesn’t understand what Star Wars actually is. Star Wars is archetypes. Good vs. evil. Star Wars is adventure, excitement, characters, humor, swagger, amazing locations and more amazing creatures.. It’s about people who are nothing becoming something. And yes, The Phantom Menace has some of those things, but certainly not enough—and certainly not in a story that grabs the audience in any meaningful way. Why did I decide to revisit Star Wars Episode I: The Phantom Menace? Because we have six weeks until Star Wars: The Force Awakens, and I figured I’d rewatch one Star Wars movie per week, as a lead up. So I started at the beginning and, in the coming weeks, you’ll read about the other five as well. Oddly enough, “the beginning” is probably one of the biggest issues in The Phantom Menace. When it was released, fans had been waiting over 15 years for a new Star Wars movie, and anticipation was at an all time high. So things should have started with a bang. The world was George Lucas’ oyster, he could do absolutely anything. Star Wars was back! After the crawl, The Phantom Menace drops us in the middle of a trade dispute. Confused ambassadors taking orders from some kind of larger enemy, and even the Jedi in the middle don’t know what’s happening. Literally the first 20 of the movie feels like Lucas cut out 40 minutes beforehand, which contained some necessary context. All he had to do was look at his other movies. The original three Star Wars movies begin relatively simply, with conflicts between good and evil: Darth Vader and Princess Leia, The Empire vs. the Rebels, Luke vs. Jabba. Each is simple, relatable and interesting. This movie, though, starts with laughably convoluted, stupid and non-engaging series of events. 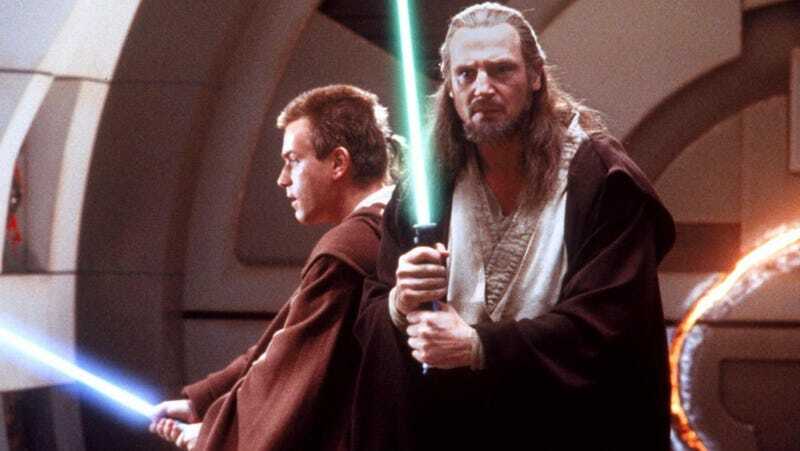 By the time Obi-Wan and Qui-Gon are swimming underwater, you can’t help be ask, “What the hell is happening?” Even the lightsaber battles serve no purpose, as the Jedi cut through Battle Droids like they were wet tissues. Nothing works. So we find out the trade disputes are just a cover for an invasion, the Jedi go to the planet of Naboo and meet Jar Jar Binks. I won’t get too deep here, as way too much has been written about his awfulness of Jar Jar. What I will say is when you are 30 minutes into your movie and your third lead speaks a dialect filled with words the audience doesn’t understand, it’s not a good thing. This leads the trip to meet the other Gungans, and then take a trip through the planet’s core to get to the Queen. This scene struck me as incredibly problematic. Qui-Gon, Obi-Wan and Jar Jar take a Bongo across a deadly short cut to the Queen’s palace. We know they, eventually, have to meet the Queen—because if they don’t, holy crap how much longer could we delay the main story? But on the way they keep running into all these huge fish. Design-wise, they’re good looking, scary creatures. But only Jar Jar seems scared of them, and encountering them doesn’t push the story or character forward at all. It’s an excuse for a quick chat before they get to the Queen and with a bunch of expensive effects. It’s literally a pointless scene. That said, The Phantom Menace truly begins when Qui-Gon and Obi-Wan finally meet Queen Amidala. Unfortunately, it takes about 25 minutes for that to happen. I can’t think of a worse mishandling of a franchise start than the beginning of The Phantom Menace. It’s like George Lucas lined up for the 100 yard dash at the Olympics and not only tripped at the start, but crawled the first half of the race with bloody nose. The group is forced to land on Tatooine and there, they meet Anakin Skywalker. You hear so many stories of how bad Jake Lloyd is in these movies but in his first scene, he’s actually kind of great. He’s cocky, he’s confused, he’s got a chip on his shoulder. I was almost ready to make this piece a defense of Jake Lloyd—but, over the rest of the movie, his performance becomes incredibly inconsistent. Part of that may be editing, but there’s no denying he has problems conveying such a complex character. I don’t actually blame Lloyd for that, though. I blame Lucas for not giving him the best direction, and also making him just a bit too young. If Anakin had been older, it would have made his relationship with Padme more believable, and given him enough emotional maturity to make some crucial decisions. You almost get the sense that, at his age in the film, he would have had a bit more innocence. Moving on. Qui-Gon needs parts for his ship, but has nothing of value to trade, so Anakin comes up with the idea of entering the podrace. While lots and lots and lots of the film’s effects do not hold up in 2015, the podrace does. It still looks real and provides some actual excitement, mostly because there are stakes. If they lose, they can’t leave the planet. If they win, Anakin is freed and will get to become a Jedi. That melds with the visuals for what’s probably the best scene in the movie. However, once they leave Tatooine, the film once again gets hamstrung with muddled trade disputes and political positioning. You may say that at least on Coruscant we finally meet the Jedi Council. The problem is there’s no real build up to it. They’re just characters in seats that have no real weight other than what we’re told. Oh, and we recognize Yoda. Lucas fails to give the Jedi the gravitas of the Senate, which exists in an epic dome with floating platforms and stuff. That stuff feels important, but what happens is so boring (“I call for a vote of no confidence in Chancellor Valorum”) it doesn’t matter. Sure, we realize who Senator Palpatine is going to become and how important this moment is in the development of his arc—but that’s not something the film earns. It’s something built in from the other movies. Skipping ahead a bit, when I saw The Phantom Menace in theaters (which I did. A lot) I would always love the film’s finale. Once they get back on Naboo and the film cross cuts between four different action scenes, it was incredibly rousing. Now, it’s less so. The battle between the Gungans and Battle Droids feels pointless and the terrible green plains are a huge eyesore. Queen Amidala and her group firing through the palace is made interesting mostly by the music. Then there’s the iconic two-on-one lightsaber battle between Darth Maul, Qui-Gon and Obi-Wan. There is absolutely no arguing the visual poetry of this scene. John Williams’ Duel of the Fates is also amazing and together, it’s a nice combination of elements. Still, watching this scene for probably the 30th time I found it much less exciting this time. It definitely has that Star Wars look, but it feels kind of secondary to the rest of the plan. We know the Jedi have to find out about the Sith, but fighting him feels insignificant compared to the story the movie has created. Even the scene itself has to add in artificial tension with those red energy things. Are they cool? Undeniably. But not as cool as I remember. They’re just another obstacle delaying things that much longer. Of the four threads at the end of the movie, my favorite this time was actually Anakin’s. His dog fight in space has a nice progression and feels character-driven. I also think “This is podracing,” coupled with the music, is the most “Star Wars” moment in the entire movie. So that helps. Once the day is saved, the film feels rushed to its ending. Obi-Wan gets Yoda to allow him to train Anakin, there’s Qui-Gon’s funeral, we get an essential tease about the Sith, then the big celebration, all in mere minutes. I wish that pace was applied to the first 40 or so minutes of the movie. Maybe it would’ve drawn us in more. Is The Phantom Menace as bad as history remembers? Yes and no. Yes, for all the reasons mentioned above and more. No, because it has a handful of genuine Star Wars moments. Moments, however, don’t quite make a movie.